To request a specific pen, specify the pen number and wood (eg. #2 cocobolo). 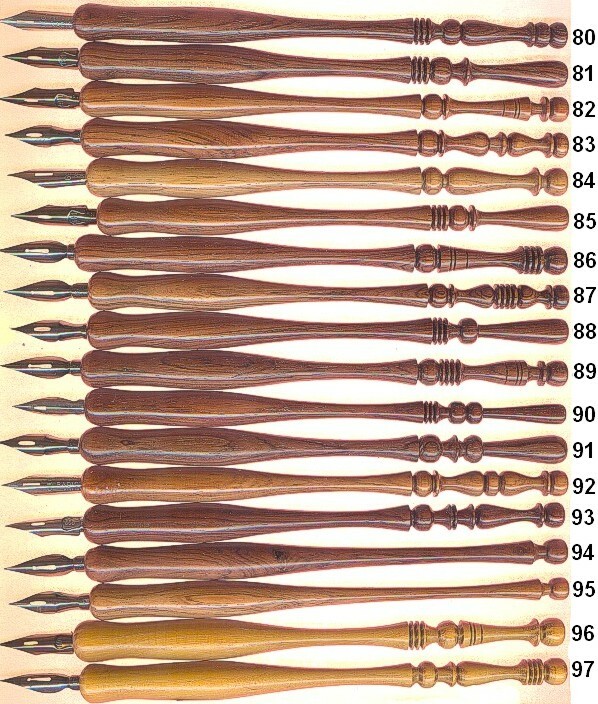 The number on the wood list corresponds to the number beside the pen on the picture. We will hold pens on reserve for one week maximum pending payment. Please, DO NOT request pens that have been labeled as SOLD . Calligraphy Pens The pens in the top picture are the "regular" Turn of the Century calligraphy pens. Though the grip varies in thickness, they are made from stock that is about 1/2 inch in thickness. The bottom picture has slightly thicker pens, based on 5/8 inch thick stock. The wood on most of the pens is about 7 inches long. Restocked with new pens on 10/15/2017. These pens are made from thicker stock and thus have a thicker grip area. Many calligraphers find them less fatiguing.